On March 5, 2005, Meredith Town Historian, Bernice Telian, asembled a group of interested individuals and formed Meredith Historical Society. 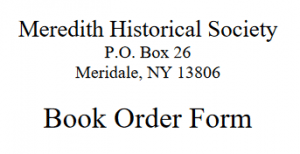 Its original name, Meredith Township Historical Society, was shortened to Meredith Historical Society when we were informed by the Board of Regents that New York State does not have townships; hence, the word “township” could not be used in our name. 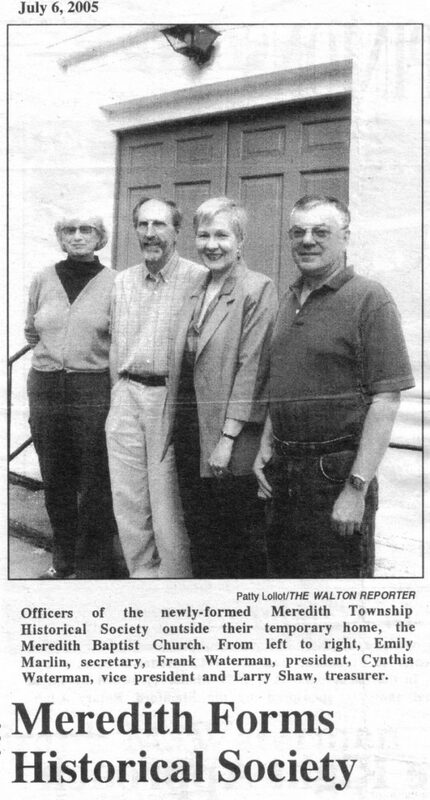 The following newspaper article announcing the formation of the society was published in The Walton Reporter July 6, 2005. The mission of Meredith Historical Society , a nonprofit educational corporation, is to collect, preserve, and interpret the history of the town of Meredith; making that history available to the general public by presenting historical programs, exhibitions, and other events of historical nature to enhance the public’s knowledge and appreciation of local history. The historical society does not own a building at the present time. We have been able to fullfill our mission without building ownership in the following manner. Our educational programs are held at the Charlotte Valley Presbyterian Church in East Meredith, NY. We use either the sanctuary, which seats approximately 150 or the basement, which seats approximately 70 for our programs. The Church is handicap accessible and has a parking lot in the rear. The historical society makes an annual donation to the Church for the use of the facility. Our collection is housed at Hanford Mills Museum in East Meredith, NY. The museum provides us with space in its temperature and humidity controlled archive for the portion of our collection that requires environmental control and space elsewhere for 3-D objects that do not. The historical society makes an annual donation to the museum for housing our collection. Our board meetings and most committee meetings are held in Meredith’s town hall at no charge. In 2008, we seriously investigated either (1) constructing a building or (2) renovating an existing building as a home for the society. However, the quotes for these projects were in the $200,000 to $250,000 range and our board of trustees decided we did not have the means to undertake and sustain such an expensive project so early in our existence. By keeping our overhead low, we are able to accumulate funds for acquiring our own building sometime in the future. The emphasis of our programs is teaching local history, although some of the programs are of regional or general interest, and some are musical. The presenters are generally drawn from the local area although we have utilized the New York Council for the Humanities ‘”Speakers in the Humanities” program and other outside speakers from time to time. Our programs are held in the Charlotte Valley Presbyterian Church in East Meredith, beginning at 7 p.m. on the first Thursday of the month unless otherwise stated. All programs are free to the public. We actively collect photographs, documents, and other historical artifacts relevant to Meredith’s history. Samples of the items that have been donated to us during the past two years can be found on this website under the category “Collections > Recent Donations.” At the present time there are approximately 4,000 objects in our collection. In 2009, the town of Meredith gave the historical society custodianship of its historical collection. The town’s collection, which contains over 3,000 objects, is now the largest segment of our collection. It consists primarily of photographs and other historic documents and records, although there are also a number of 3-D objects. Almost everything in our collection is digitized and the images are stored in a computerized data base using a program called, “CollectionMaker.” This software was developed for us by Bob Rosen, a member of our society. We believe this software has many advantages over commercially available software for small historical societies. Its main attributes are that data entry is much more efficient, the powerful search engine is easier to use, and with everything digitized, documents can be easily read via the computer without pulling boxes from the archive, and all documents and photographs can be printed or copied directly from the computer. Thus, researchers can have complete access to our data base from our laptop computer, where they can view, read, and make copies of anything in our collection without ever having to sort through archival boxes. Meredith Historical Society has grown to approximately 140 members. Approximately one third of our members live outside the local area. Meredith Historical Society is financially stable. By keeping our overhead low, we are able to generate sufficient funds through memberships, donations, an annual stipend from the Bert Santora Memorial Trust Fund, and our fundraising efforts to meet our operating expenses and add to our building fund each year. At the present time, there is more than $45,000 in this fund. Our primary fundraiser is an annual pie auction held in April. We receive excellent support from the community and raised $1,000 in 2009, $2,000 in 2010, and $1,200 in 2011. Meredith Historical Society applied for and was granted tax exempt status under section 501(c)(3) of the Internal Revenue Code on August 30, 2006. We have applied for and received three grants from the Bert Santora Memorial Trust. In 2009, we received a $4,500 grant to purchase portraits of Issac and Deborah Burr painted by in 1853. In 2010, we received a $2,500 grant to establish a computerized data base and in 2011, we received a $4,200 grant to develop this web site.